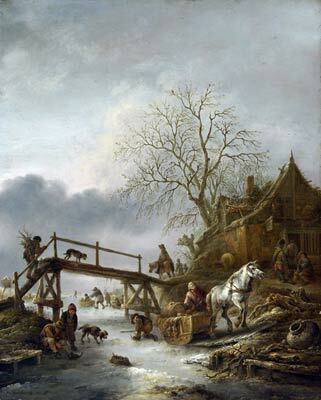 Isaac van Ostade (1621 - 1649) was a Dutch genre and landscape painter. Van Ostade began his studies under his brother, Adriaen, with whom he remained till 1641, when he started his own practice. At an early period he felt the influence of Rembrandt, and this is apparent in a Slaughtered Pig of 1639, in the gallery of Augsburg. He soon found a style more suited to his own inclinations.